General Dynamics NASSCO has been awarded a $498 million contract to build the fourth Mobile Landing Platform that will be the second configured as a so-called Afloat Forward Staging Base for mine countermeasure (MCM) helicopters and special operations forces (SOF) and U.S. Marines, the company announced on Monday. The ship — based on the hull of an Alaska-class crude oil tanker — will be built at NASSCO’s San Diego, Calif. shipyard and will be completed by 2018, according to a Friday Department of Defense contract announcement. 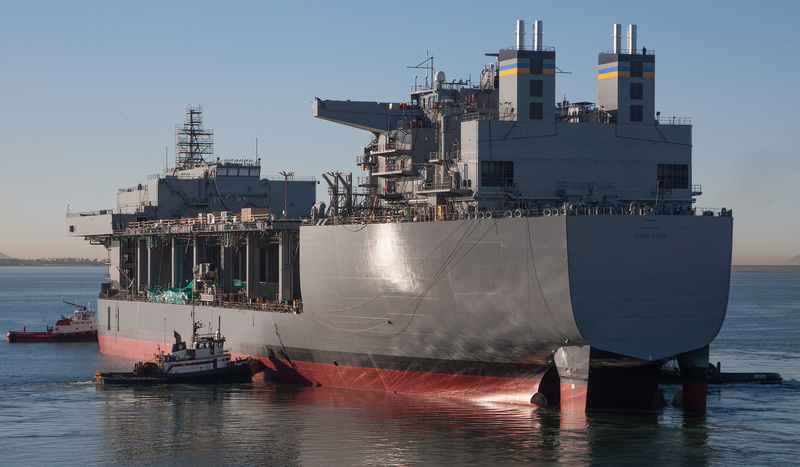 “Under this option, NASSCO will provide the detail design and construction efforts to build the second AFSB of the Mobile Landing Platform-class ships,” read a statement from NASSCO. The contract modification that funds the construction follows the first AFSB — USNS Lewis B. Puller (MLP-3/AFSB-1) — which was launched at the San Diego yard in November. The 764-foot ship will field large helicopter deck capable of fielding MH-53E Sea Dragon MCM helos and provide accommodations for up to 250. 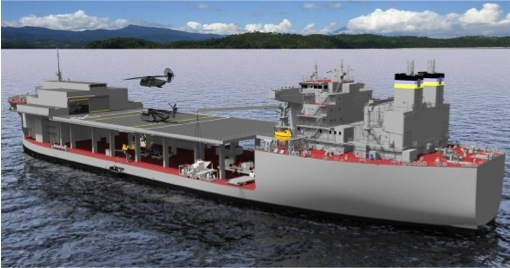 Lewis B. Puller is slated to become operational in 2015 and will likely replace the current AFSB stand in — USS Ponce (AFSB-(I)-15). The second AFSB — contracted on Friday — will most likely based in the Pacific. U.S. Military Sealift Command (MSC) took delivery of the second MLP — USNS John Glenn (MLP-2) — in March. MSC will operate all four ships. The following is the Dec. 19, 2014 DoD contract announcement on the second AFSB. General Dynamics National Steel and Shipbuilding Co., San Diego, California, is being awarded a $498,116,529 modification to a previously awarded fixed-price-incentive, firm-target contract (N00024-09-C-2229) for the procurement of the detail, design and construction of the fourth Mobile Landing Platform Afloat Forward Staging Base. Work will be performed in: San Diego, California (70 percent); Pittsburgh, Pennsylvania (7 percent); Chesapeake, Virginia (7 percent); Beloit, Wisconsin (6 percent); Iron Mountain, Michigan (2 percent); and various locations in the United States (0.8 percent); work is expected to be completed by March 2018. Fiscal 2014 shipbuilding and conversion (Navy) contract funds in the amount of $498,116,529 will be obligated at time of award and will not expire at the end of the current fiscal year. The Naval Sea Systems Command, Washington, District of Columbia, is the contracting activity.